Hope you all are doing great!! A few days back I posted about the debut in skin care range “L’oreal Paris Skin Perfect Anti- Imperfections+Whitening Cream 20+” and what I liked about this particular cream. As you all have already read in my last post, L’oreal has come up with all new Skin Perfect Range and has launched skin perfect anti-imperfections + whitening cream for 20+, 30+ and 40+ age group. Best thing about this range is that all the creams come with age specific requirements and it is the most cost effective range from Loreal Paris ever!! You may have a look at complete range from Loreal Paris here. 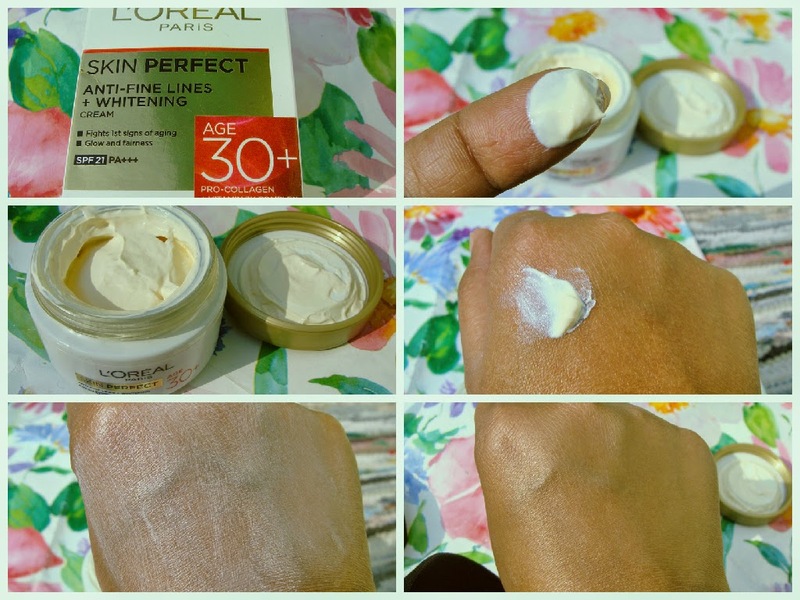 Today I am going to review “L’oreal Paris Skin Perfect Anti- Imperfections + Whitening Cream 30+”. Generally the signs ageing such as fine lines start appearing on skin as we hit 30. Though these don’t appear much in the start as its a slow process but when you get to notice these signs its already late. So better start taking care of your beautiful skin as you approach 30. So, I was really excited when I got this product and here is my experience. Skin Care Customised for your age: The skin has different needs at every age. L’oreal paris has created SKIN PERFECT, a range specifically formulated to address these specific skin needs. From the age of 30, accumulation of fatigue and busy days may lead to dullness of skin and first signs of aging such as fine lines. L’oreal research has selected powerful actives and specifically designed this cream to act on skin texture and skin tone of Indian women from 30 years old. Smooth evenly onto clean skin over face and neck, at least once a day. Avoid contact with eyes. If contact occurs, rinse with water. Thick consistency and spreads evenly on skin leaving no whitecast and absorbs quickly. I have got 3 creams – 20+, 30+, 40+, so I couldn’t try all on my own. That’s why I asked my younger sister to try out the 20+ cream (which I reviewed last week) while I started using cream for 30+. I am trying this range for more than a 1 month now on a daily basis once a day and quite liking the effects. I am quite satisfied with the results. Firstly, the fragrance is so nice, it leaves you mesmerized. It is very well hydrated and doesn’t feel heavy on face. It comes with UV filters which makes it perfect to use during days. The consistency of the cream is just perfect, neither too thick nor runny. A little quantity is enough for whole face and neck and gets absorbed easily with a gentle massage. It hasn’t brought any miraculous difference to my skin like whitening, fairer skin and all. I don’t ever go for those claims and I don’t support that sort of change of complexion. No fine lines removal. But you can notice the evenness and smoothness. It brings a nice glow to my skin. The best part is that it suits my super oily skin and doesn’t make my face greasy or oil factory and doesn’t cause any breakouts which I am quite happy with. Leaves skin glowing and shine free. Gets absorbed into the skin instantly. Makes skin appear firm and improves texture. Good classy quality packaging in glass jar. Suits oily skinned beauties perfectly, controls oiliness, mattifies skin. Have to take care of glass jar. May leave a slight white cast on some but that disappears soon. No fine line removal or fairer skin. May not suit dry skinned beauties as effectively. I would surely repurchase and recommend this to all who have just reached 30. This is the best option, especially for those with oily or combination skin as it does hydrate the skin and gives a matte look!! You may also try facial foam from this very range for the best result. This range is light on pocket and is specially meant for age specific problems. *PR Sample but unbiased review.. I am not a huge fan of L'oreal skin care range, they never make any differences on my skin. For drugstore skincare the only brand I ever trust is Olay, the products are fantastic! First time in your blog and I’m impressed! Everything is so beautiful! Very informative review Charu … That was such a detailed review, I am sure after reading the review there is no second thoughts on the product. I should try this out. I am using creams for 30 plus and can see that they doing a great job. Mostly it is Eucerin cream and Eucerin hyaluron – filler. Loreal is also fantastic, my mother use it often. I really liked the 20+ cream. I'm using it nowadays. It is real good.